Peanut Sundal recipe with step by step photos. Here comes another week of the Protein Rich themed Blogging Marathon. If you have followed me for quite some time you would have noticed that we a group of bloggers are running a month of Mega Marathon themed Protein Rich recipes. I have been selecting some sub themes each week. Last week it was Protein rich Dal recipes and this week it is going to protein Rich Sundal Recipes. So the next six days is going to be some protein Rich Sundal. As we all know Navaratri festival is round the corner and Sundal is an important food served on the days of Navaratri. Either an offering to good or as a snack for the friends and relatives who visits the golu. 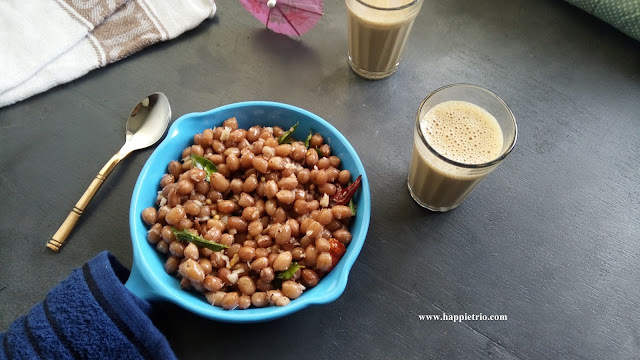 So I thought this is the right time for posting Sundal Recipes .So here we go Peanut Sundal for the day. 1. Soak the Peanuts in water for 1 hour .Then add the soaked peanuts into the cooker along with the required water till the peanuts sink and salt and cook for 3 whistles. Once cooked drain the excess water and take the cooked peanuts and set aside. 2. Now heat a pan add in oil once it becomes hot add in Mustard seeds and Urad Dal, let them splutter next add in the Hing, Dry Red Chilli and Curry Leaves. 3. Next add in the cooked peanuts and salt if necessary (as we have already added salt while cooking the peanuts.) mix well and then add in the grated coconut. 4. Mix well and cook in a low flame for 2-3 mins and switch off the flame. Tasty and Healthy Peanut Sundal is now ready to be served. · No need to add roasted peanuts for this recipe. Use the raw peanuts. If using fresh peanuts no need to soak you can directly pressure cook. · You can also add ghee in this recipe and it gives a nice taste. This is yet another favorite sundal for Navratri..good one..
Wow ! Brings back memories of South trip . These sundals are popular on hill stations and I love these boiled peanuts , they taste fantastic , and what a great pick . I am not a fan of raw / roasted peanuts but I love its Sundal variation. Your dish looks super tempting! 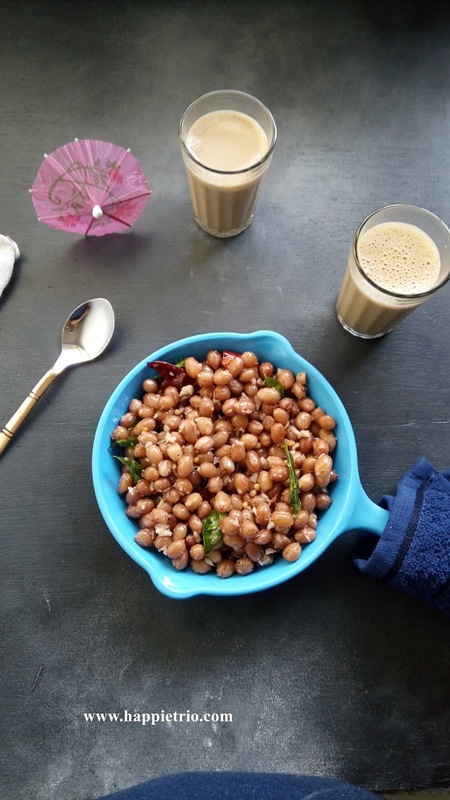 Never get bored of peanuts and this sundal is my all time favourite, i can have a huge bowl of this nutritious sundal without any guilt. One of my fav sundal varieties. Whenever we go to beach, we never forget to buy this and enjoy in the breeze. Looks so tempting..
Like I told PJ I cannot make a decent sundal this one too seems beyond me. But will try its yummy. Peanut Sundal looks very inviting. Love the pictures too. I was raised on different kinds of sundal as my younger brother was a very picky eater. Sundal, potatoes or vazhakka would be prepared everyday for his sake. Peanut sundal is a favorite of mine among all others. I could easily snack on a whole bowlful of this. I love boiled peanuts. Nice flavors. Peanut sundal looks tasty and protein packed meal. Perfect sundal for a snack as well as for Navaratri! perfect sundal for these rainy days!! One of my favorite sundal,nice presentation and clicks.